Product prices and availability are accurate as of 2019-04-24 04:36:02 UTC and are subject to change. Any price and availability information displayed on http://www.amazon.co.uk/ at the time of purchase will apply to the purchase of this product. 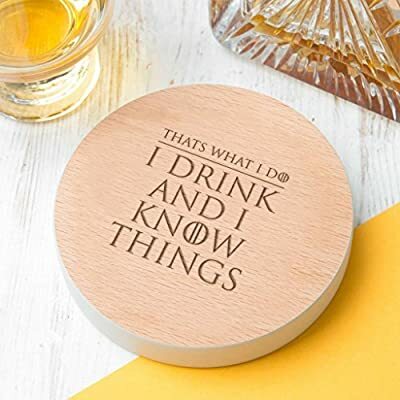 One of the best quotes from Tyrion Lannister "I drink and I know Things" beautifully engraved onto a beech wood coaster to make a perfect game of thrones gift for a super fan. Personalise your gift with 7 Colours available to choose from. Or make it extra special by adding a branded dust and things gift box or engraving a personalised message on the back of the coaster, its our unique alternative to a card that will stand the test of time!